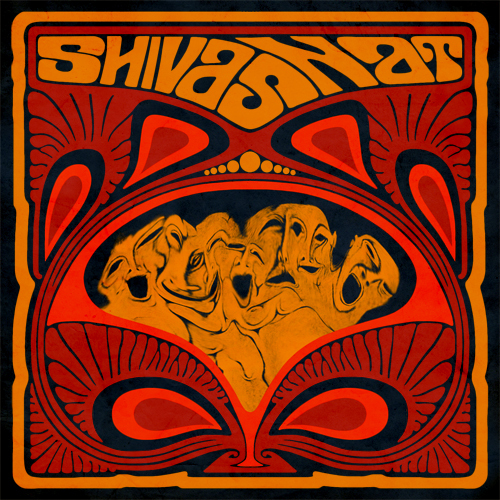 Shivas Nat is a psychedelic garage/blues quartet from Denmark that consists of Patrick Lykke Heinsøe on vocals/guitar (Ex-Highway Child), Morten Clod-Svensson on the bass (Ex-Fuzz Manta), Aleksander Trap-Jensen on the drums and Bjørn Sunesen on the organ (Willow’s Tale). 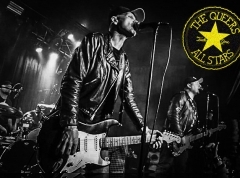 Throughout their relatively short time of being a band, they have already seemed to garner quite the amount of attention as a live-act that ‘has’ to be seen. My own experiences with the band have been of a similar nature and as such, I was quite eager to hear if they could compress that live-energy into a studio-release. – Which they have, in my humble opinion, managed to do quite well on this EP. The opening track “The Shape of My Soul” is a melancholic long-runner that opens with a psychedelic swirling madness of echo guitars, rotating organ sounds and the like, only to evolve into a vast soundscape with a simple, yet haunting melody and a ridiculously tight rhythm section to it, that is underlined by the evocative singing, the chiming guitars and swirling madness of the organ on the track. Throughout the 11 minutes of the track, the vocal work evolves from delicate and melancholic to soulful and ‘tortured’ along with the dynamic changes and the various instruments enjoying their time in the spotlight, thus entertaining the listener to such an extent that the 11 minutes seem like a relatively short span of time. Don’t worry though, the EP doesn't only contain soulful moods – it also contains a few solid rockers like “I’m Alive” and “Dragonodyssey”. The former has a relatively simple yet dynamic riff to it that is reminiscent of early Deep Purple with its mixture of heavy bass, tight drumming and the classic combination of the fuzzed out guitar and the swirling organ tones. The vocals that were so soulful and melancholic have taken a slightly more rocking turn on this track as things start to get rowdy and nearly take a swing into stoner-territory. Throughout most of the EP there is a consistent rehearsal-space jam to it – in a good way, since nothing really seems overproduced nor over thought. On the contrary it is hugely psychedelic in the way that these songs seem like they are built up on spur of the moment ideas that have then become incorporated into the final form. A such example can also be heard on the closing track “You”, where vocals and guitar stand completely alone until finally, several minutes into the track, the rest of the band just ‘joins in’ and the track evolves into a massive jam with guitar solos flying everywhere, echoes going ballistic all the while underlined by a rhythm section that continuously impresses me. While this kind of music is clearly not for everyone, this EP is still one of those releases that can blow your mind if you let it. - So if you're into this kind of thing, I suggest listening to it in a darkened room while just letting the swirling madness take over. Anyway, to sum up I initially had my fears that Shivas Nat couldn’t live up to their live performances when going into the studio, but luckily I was proven wrong. My only problem with this release is the length of it – and no, it’s not too long. My whole problem with it is that it isn’t a full-length rather than an EP as I could have really used a little more than 5 tracks. Oh well, there is always next time.